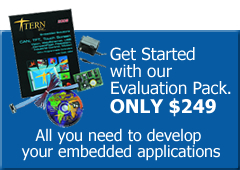 The ACU™ is an expansion card designed for TERN controllers. It can be used to add ADCs, CAN-bus, Ethernet, and CompactFlash to TERN’s family of C programmable Engine controllers. Up to 4 ADC chips (AD7655, 1MHZ, 16-bit, 0-5Vjcan be installed to provide a total of 16 ADC inputs. Each AD7655 allows simultaneous sampling on two channels in hardware. A Controller Area Network (CAN) controller (SJA1000), running at 20 MHz clock can be installed along with on-board CAN transceiver, supporting baud rates up to 1 Mb/s. CAN interrupt and software programmable hardware reset are available. The ACU™ allows TERN controllers to be directly connected to CAN-bus. All registers of the CAN controller are software accessible, and software-buffering drivers are also provided. A Fast Ethernet Module can be installed to provide 10/100M Base-T network connectivity. 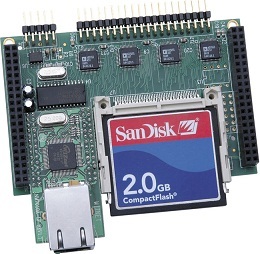 This Ethernet module has a hardware LSI TCP/IP stack, implementing TCP/IP, UDP, ICMP and ARP, and is programmed using a software socket interface.